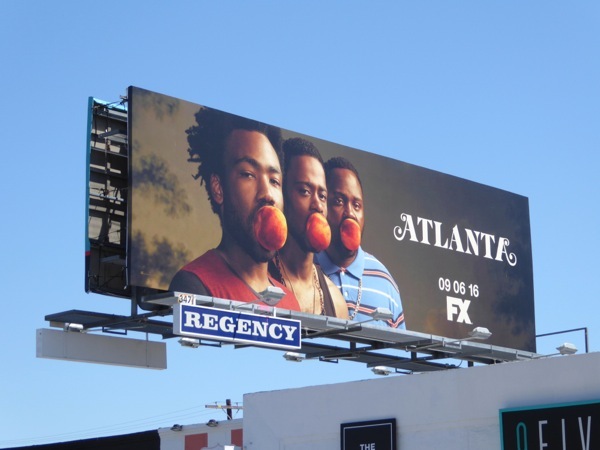 The skies of L.A. have been filled with a veritable smorgasbord of Fall TV season ad creatives these past few weeks, so what better way to start another TV WEEK here at Daily Billboard than with this humorous billboard for FX's new comedy Atlanta. 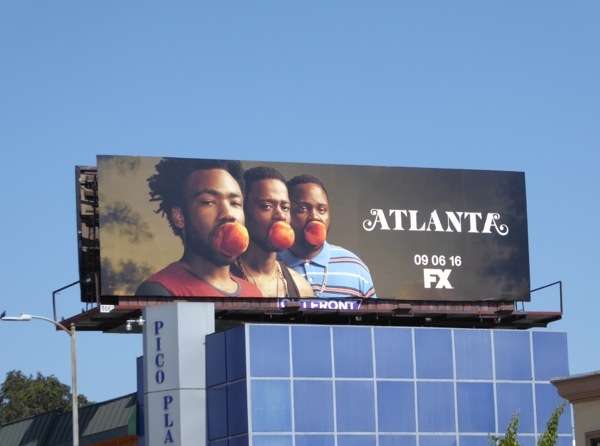 You can always guarantee that FX delivers eye-catching visuals for their series, and this irreverent example for Donald Glover's new Atlanta-set comedy is no exception, with the show's creator and his cast-mates Lakeith Stanfield and Brian Tyree Henry with Georgia's state fruit, the peach, stuffed in their mouths. 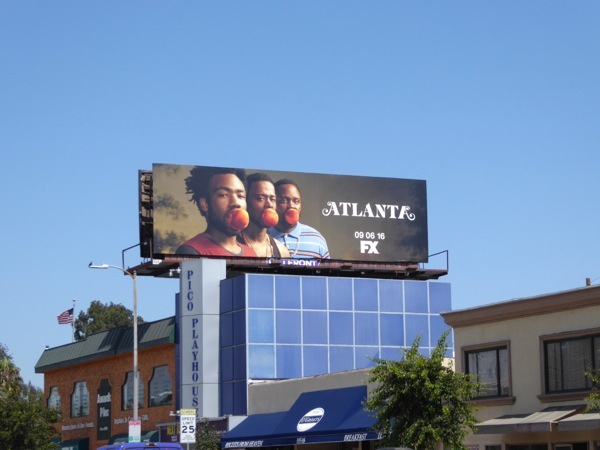 The series follows two cousins trying to make their way through the Atlanta music scene, one an ambitious college dropout and the other a recent rap star. 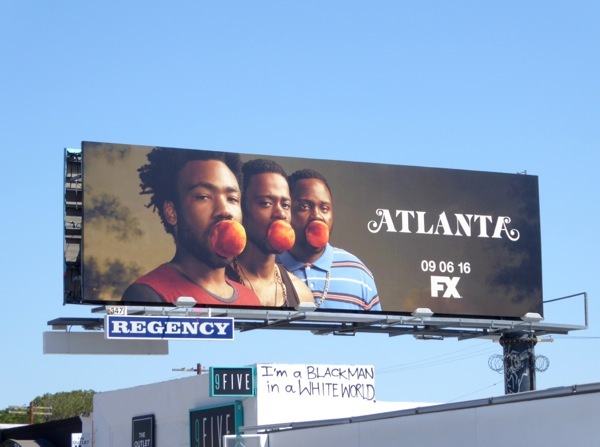 Glover is no stranger to music or comedy, being a writer, standup comedian and having worked on TV shows like Community and 30 Rock, whilst performing on stage as Childish Gambino. 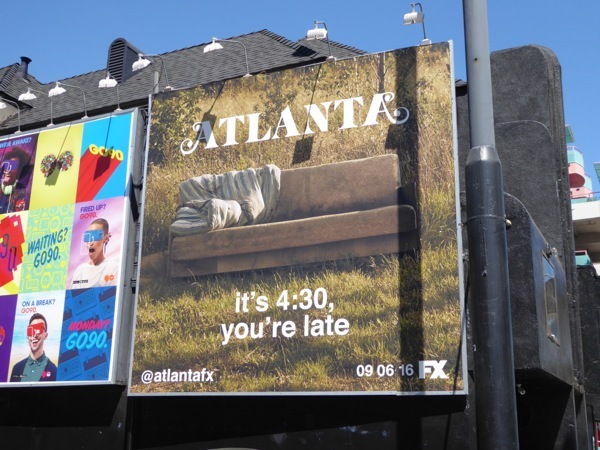 These Atlanta billboards were first spied along Melrose Avenue on August 11, then snapped later above the Sunset Strip, Cahuenga Boulevard and Pico Boulevard through August 22, 2016. 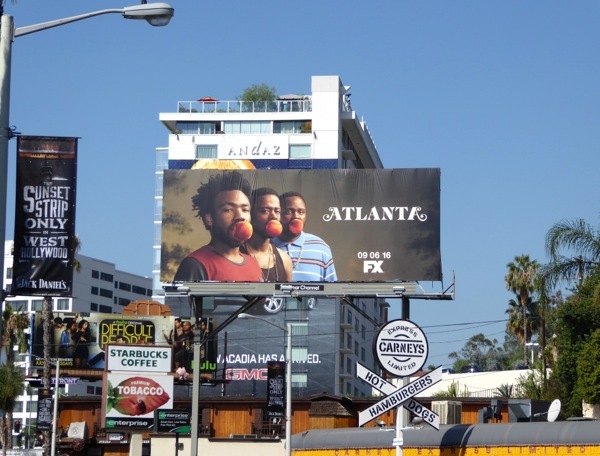 What do you think, will you be taking a big bite out of this new comedy this Fall TV season? 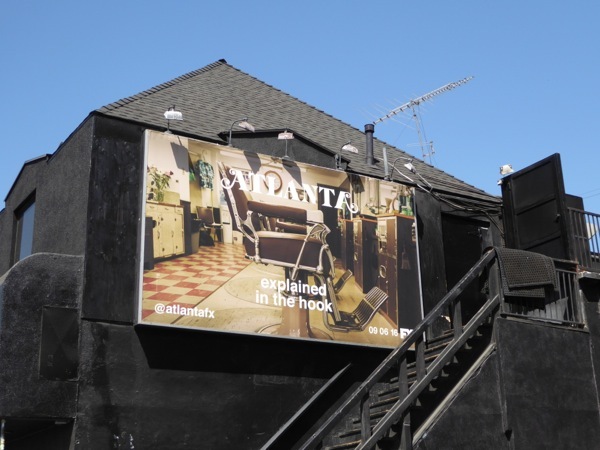 Happy Labor Day and stay tuned the rest of the week for even more great new ad creatives turning heads this August and September. 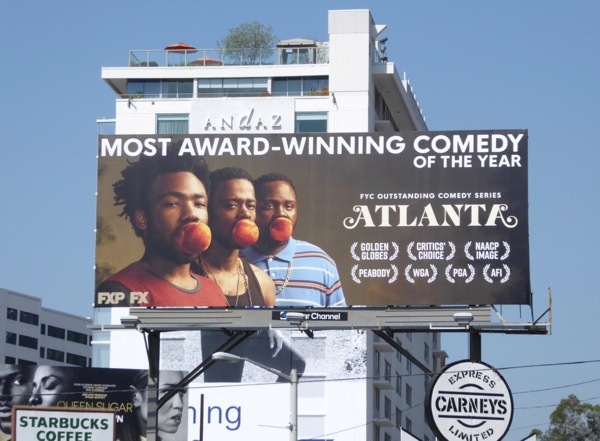 UPDATED: Atlanta and Donald Glover both took home Golden Globes in the comedy category earlier this year, but can FX's acclaimed series garner any Emmy nominations this season? 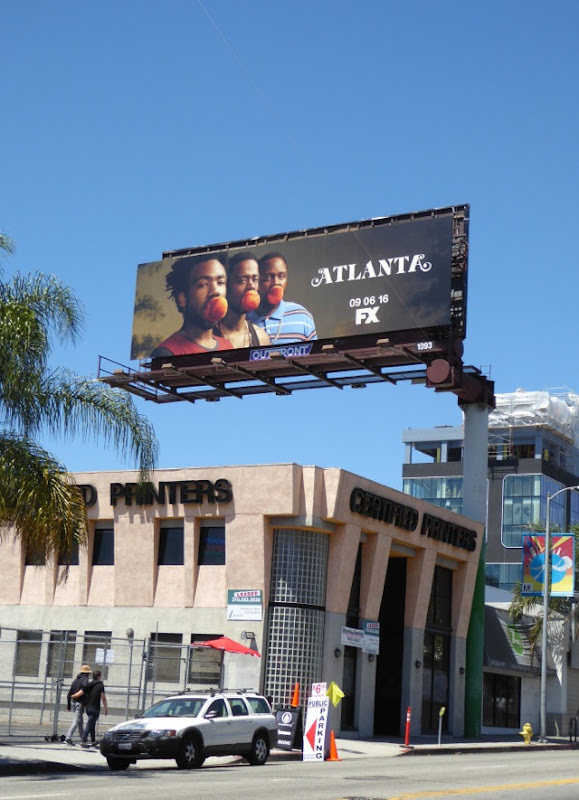 FX certainly hopes so and is starting the Emmy consideration campaign early for the first season with this billboard snapped along the Sunset Strip on April 4, 2017. 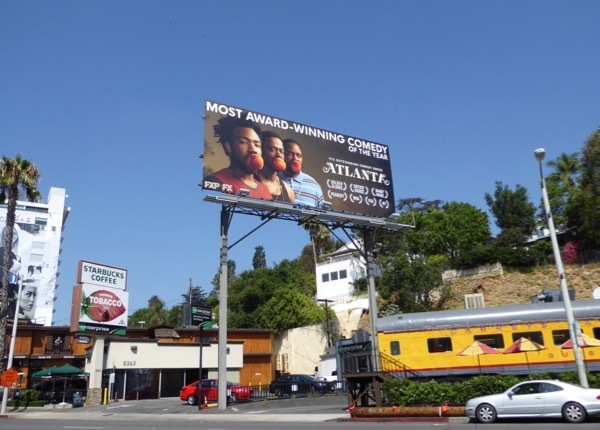 UPDATED: When he's not playing a young 'Lando Calrissian' in the Star Wars Han Solo prequel movie, Donald Glover still has plenty of time to garner Emmy nominations, five in fact, for writing, directing, acting and Outstanding Comedy Series. 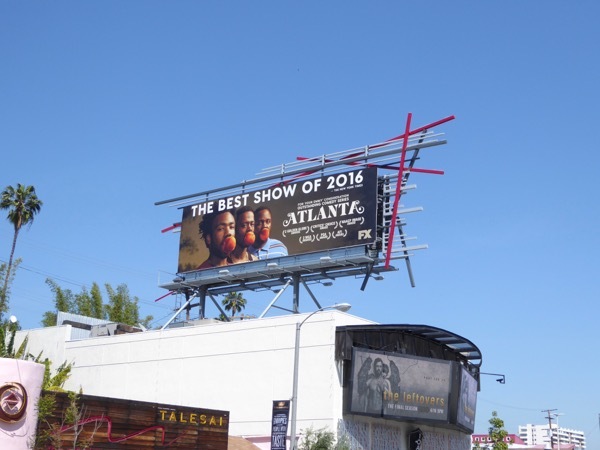 This adapted Emmy nomination billboard was spotted along West Hollywood's Sunset Strip on July 21, 2017. 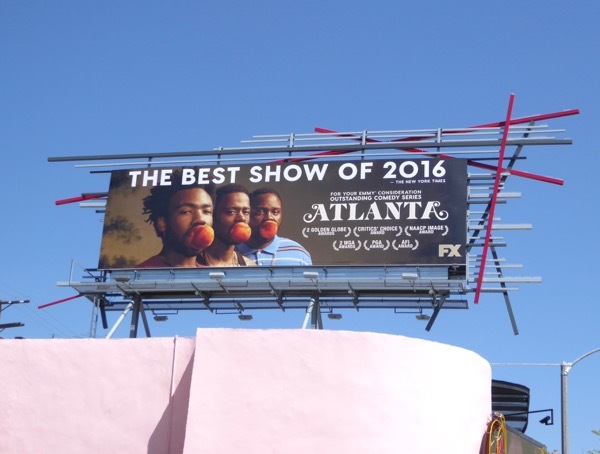 It would just be peachy if Atlanta could win some Emmys for its debut season.